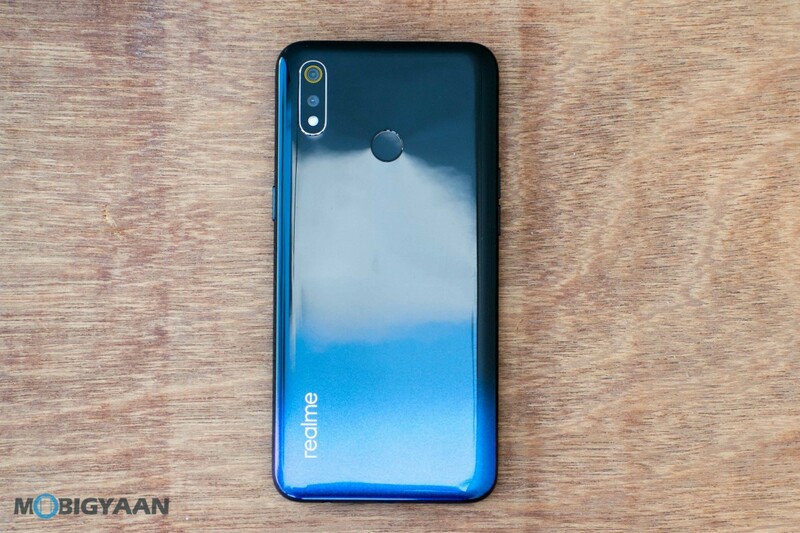 After the success of Realme 2, Realme launched its third-generation of the smartphone — Realme 3. The company has been in the market for over a year and is already on its third-generation of devices. With the starting price tag of Rs. 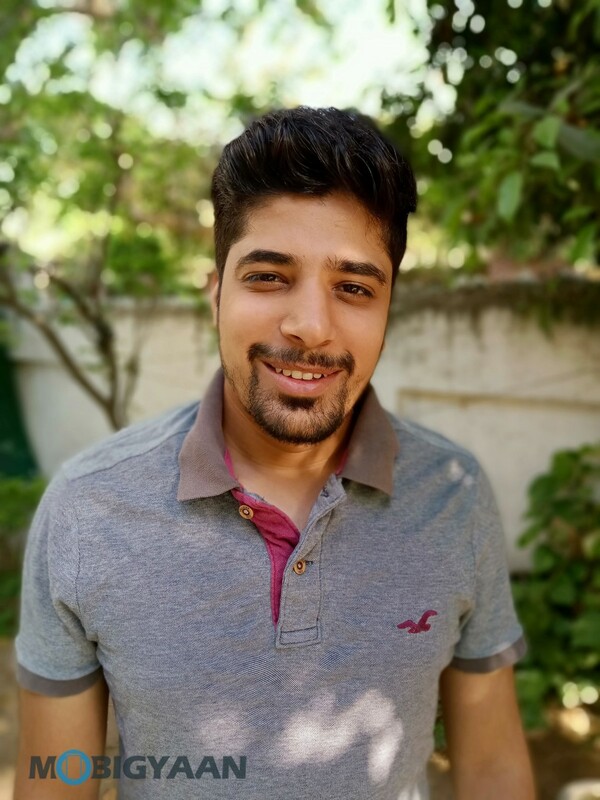 8,999, how well does the Realme 3 perform? Is the phone able to take on the likes of Samsung’s Galaxy M-series phones and the budget devices from Xiaomi, which are currently in demand in the market? Let’s find out. Colors: Dynamic Black, Radiant Blue, and Classic Black. In terms of design, the smartphone has nothing new to offer but it does seem impressive. The company has opted to offer a unibody design for the first time. 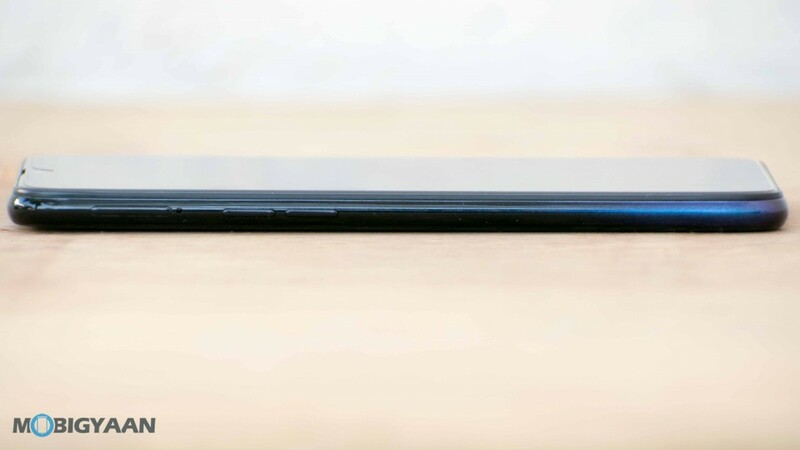 The phone also comes with a gradient finish on the back. The phone does retain a 3.5mm headphone jack. However, instead of the USB Type-C port, it comes with the older micro USB port, which is a bit disappointing. 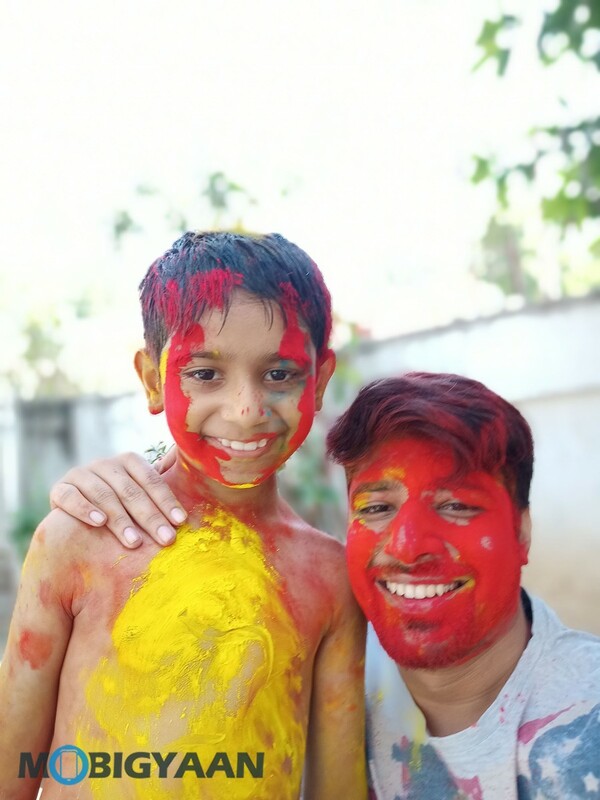 Realme should have opted for the Type-C port. 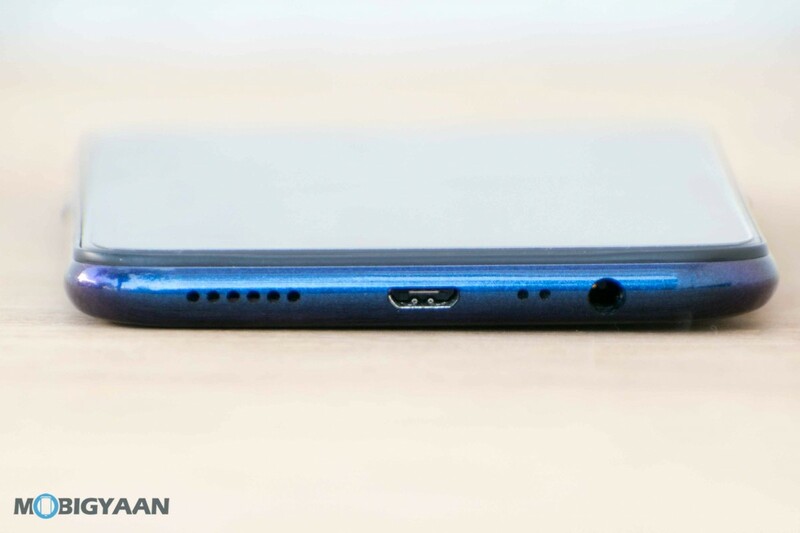 The top edge of the phone is plain while the bottom edge carries a speaker grille, micro USB port, two orifices for the microphone and a 3.5mm headphone jack. On the right edge, there’s a power button while the volume rocker keys are placed on the left edge. The left edge also hosts a SIM card tray that supports two nano-SIM cards and a microSD card for expanding the storage. 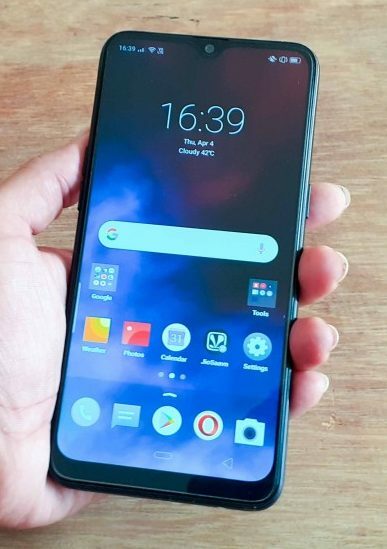 The front panel has a waterdrop notch display. On the back panel, there’s a camera module placed vertically in the top-left corner. There’s also a rear-mounted fingerprint sensor, which is quite fast in unlocking the device. The phone that we are reviewing is the Dynamic Black color variant. It has a very catchy gradient from black to sprinkled dark blue and it’s attractive. There’s also another color option — Radiant Blue. 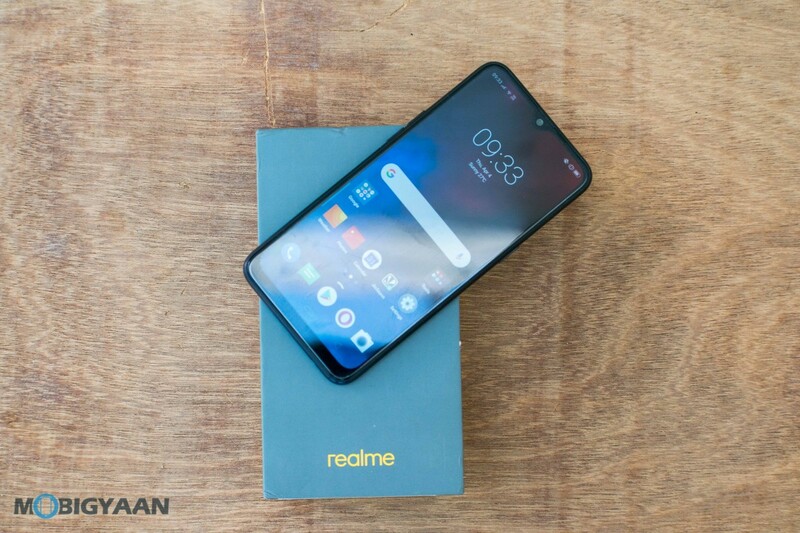 Realme 3 weighs about 175 grams and its dimensions are 75.6mm x 156.1mm x 8.3mm. 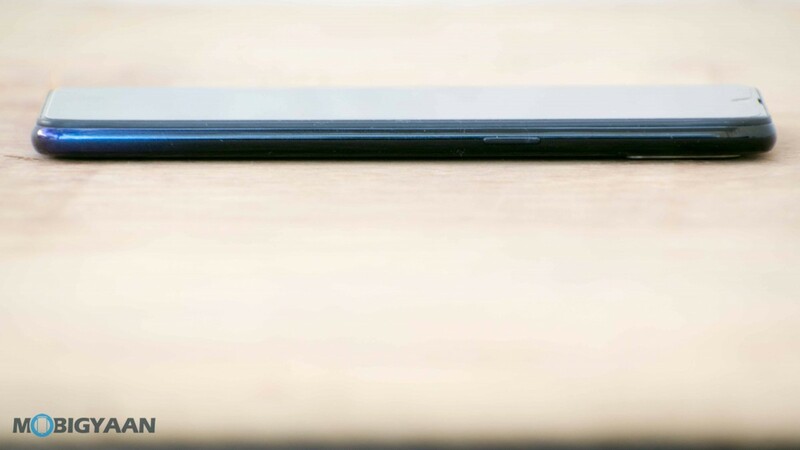 The phone feels light in the hand and doesn’t slip from the grip despite having a glossy finish. However, it’s a fingerprint magnet and the chances of getting scratches are high. The Realme 3 comes with a 6.2-inch HD+ display offering a 1520 x 720 pixels screen resolution, 19:9 aspect ratio, and 88.3 percent screen-to-body ratio. The display is protected by a layer of Gorilla Glass 3 on top. The screen resolution is a little low for the display size, especially at a time when the competition has now moved to offer Full HD displays in the budget segment as well. Thus, the images and text aren’t the sharpest but it’s not bad enough to be a deal-breaker. The 720p display is probably how the company kept the phone’s price down. Colors produced on the screen are vivid and the phone’s brightness is also good. There was no trouble in accessing the phone during the bright sunlight even though it has a maximum brightness of 385 nits. It also has an auto-brightness feature that adjusts the screen brightness as required, but it doesn’t work correctly every time. 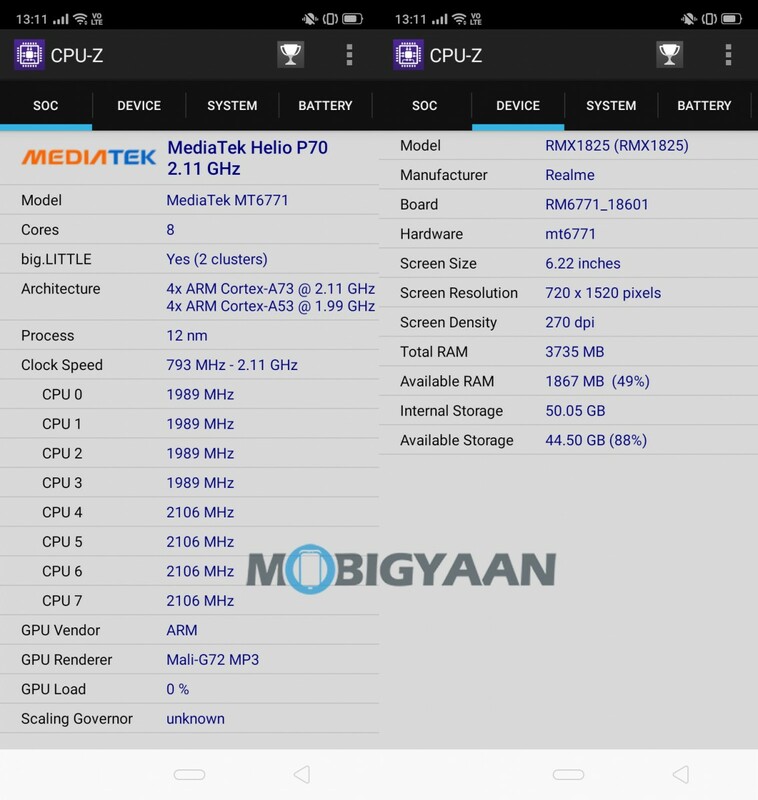 The smartphone is powered by MediaTek Helio P70 octa-core chipset, which is a good chipset for the mid-range segment. This is also reflected in the benchmark tests. 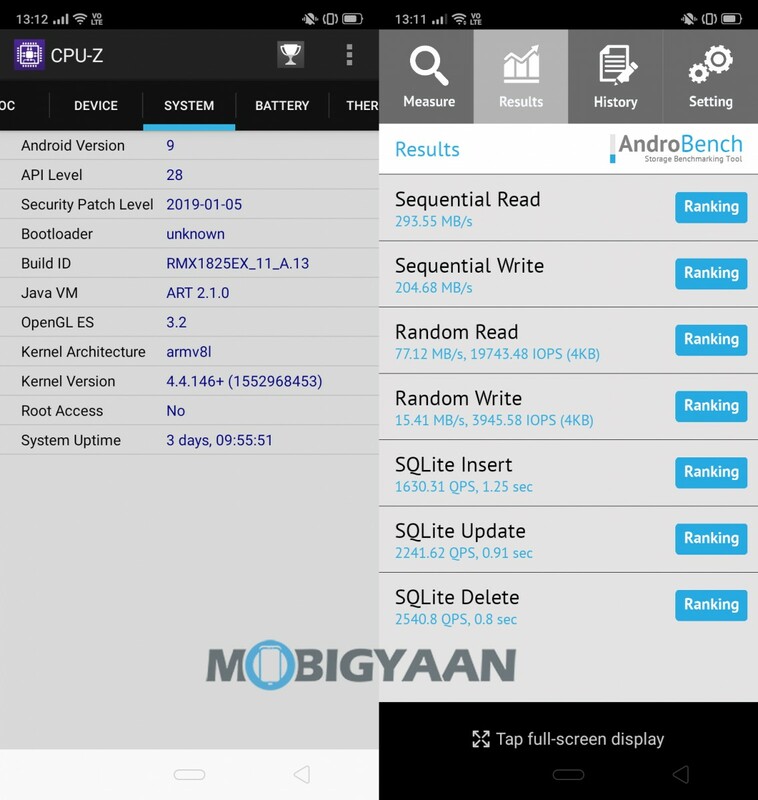 The octa-core processor is clocked up to 2.1GHz and is equipped with four Cortex-A53 cores and four Cortex-A73 cores. The processor is coupled with the Mali-G72 MP3 GPU, which is good enough for basic gaming. But do keep in mind that just like its predecessor, the Realme 3 isn’t good for the high-performance games. It comes in two variants — 3 GB of RAM with 32 GB of internal storage and 4 GB of RAM with 64 GB of internal storage. The unit we received for the review packs 4 GB of RAM. Thanks to the dedicated microSD card slot, you can also expand the phone’s storage capacity up to 256 GB. I haven’t encountered any major issues while using the phone for around two weeks. It works smoothly without any hiccups and the phone’s day-to-day performance was satisfactory. It handled multiple apps and switching between then quite smoothly. One thing that I didn’t expect from the smartphone was bloatware but unfortunately, it has got a quite few of them. It comes pre-installed with Dailyhunt, UC Browser, ShareChat, Paytm, Opera Browser, Facebook, among others. However, you can easily uninstall if you wish. It has Game Spaces, which automatically optimizes the settings for the game. When a new game is installed, it gets recognized and included in Game Space. Then when you open that game, relevant game optimization functions will be turned on to make gaming smoother for you. The single speaker can get loud but the sound output is just average. The speaker is position at the bottom, which means that you’ll frequently block it with your palm when holding the phone in landscape mode. 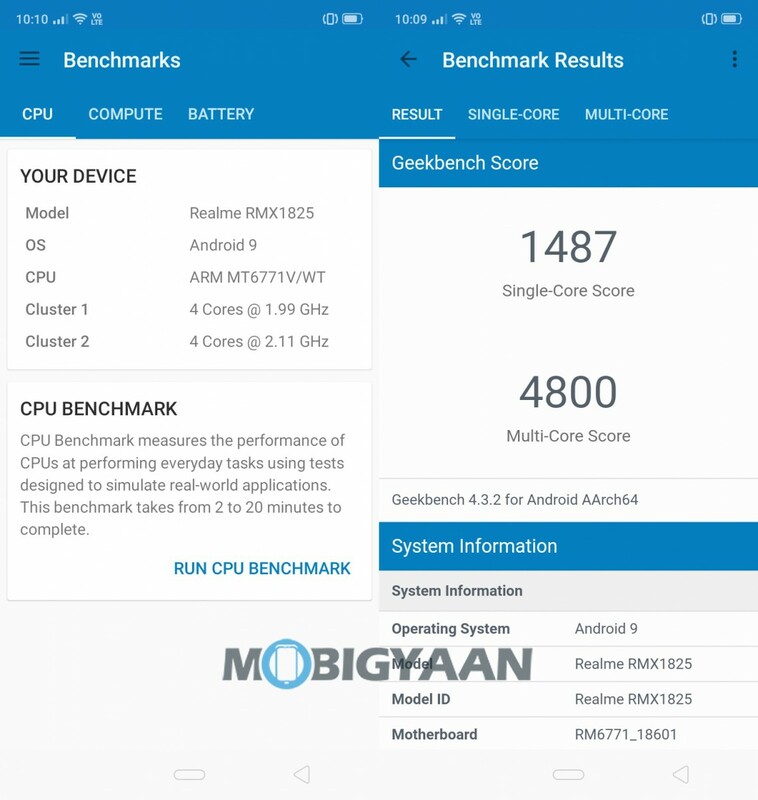 As for the benchmark, the Realme 3 scores 1,478 points in the single-core testing while in the multi-core test, the phone scored 4,800 points. 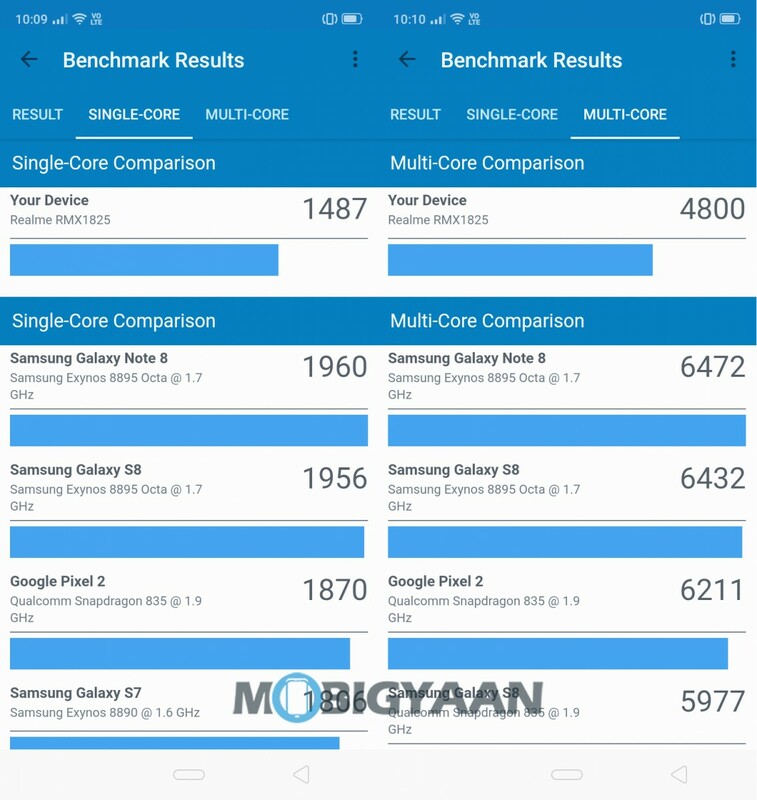 The scores are better than the Samsung Galaxy M30, which recorded 1,325 in single-core and 4,193 in multi-core. The Realme comes pre-installed with Android 9 Pie and the company’s own ColorOS 6 on top. The custom interface comes with a lot of visual customizations and is clean and simple, and also comes with an App Drawer. The first thing you notice when using the smartphone is the on-screen navigation keys. It offers just two options — home button and back button. Thankfully, you can change the navigation bar in the settings menu. I haven’t been a fan of ColorOS but this new version seems to have fixed a lot of things. 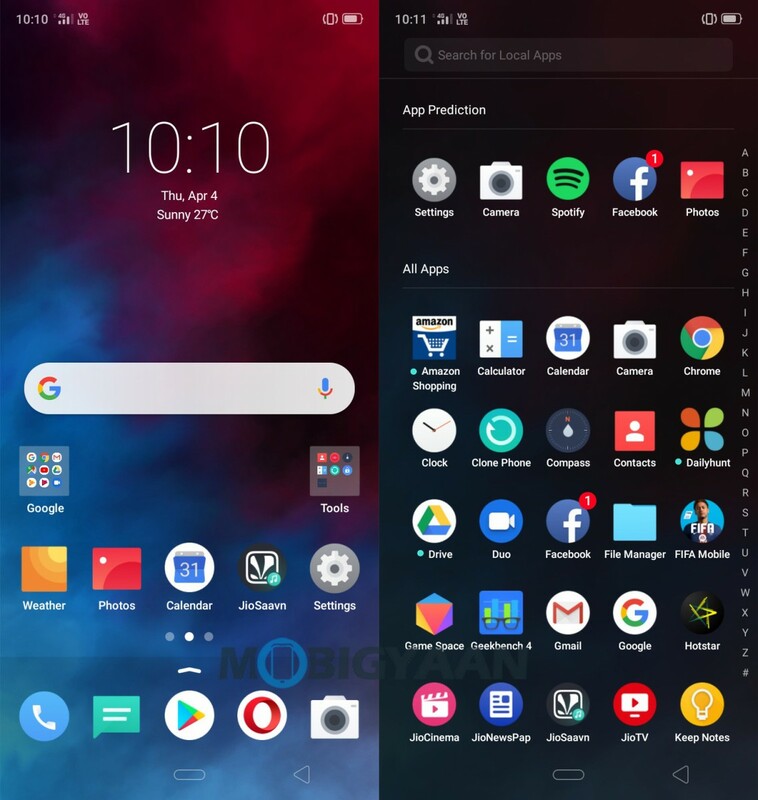 Along with improving things with its UI, the company has removed several Android Pie’s features. For instance, Google’s Digital Wellbeing feature of Android Pie is missing. Also, it doesn’t show battery level graph — a visual representation of the battery usage and instead just shows the list of apps that have been used. 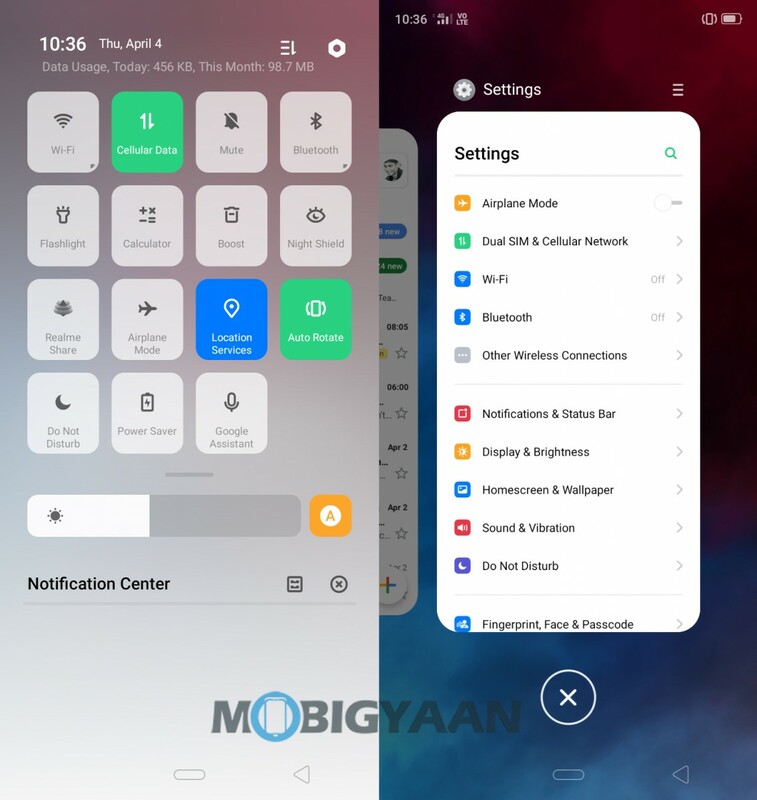 The inbuilt launcher offers you options to choose the home screen layout, navigation gestures, and other customizability. The addition of ‘Game Space’ enables game optimization with add ons like do-not-disturb mode and brightness lock. However, the animations and the notification drawer feels clumsy at times. There’s no L1 certificate or HD streaming support. 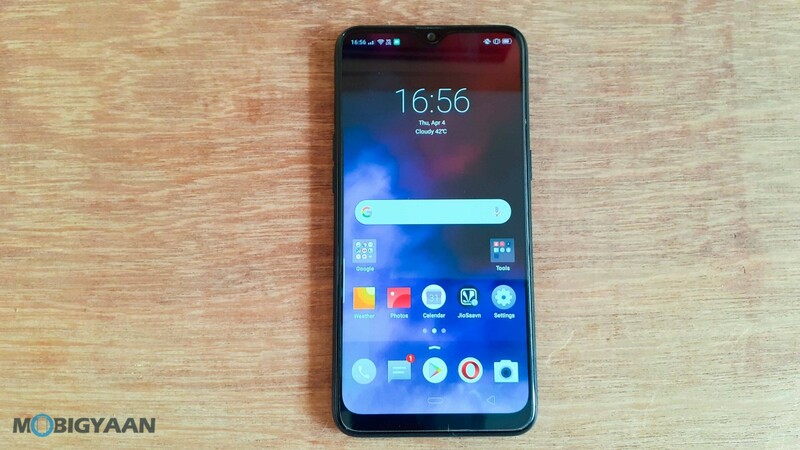 But, the new ColorOS 6.0 is surely a step up from its previous version. It has a new universal font – Oppo Sans. 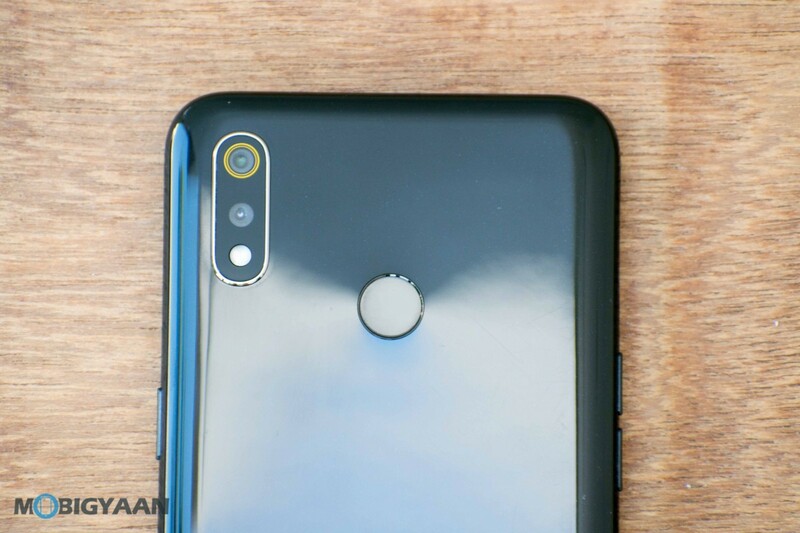 The Realme 3 comes with a dual camera setup on the back, consisting of a 13 MP primary sensor and a 2 MP secondary sensor. 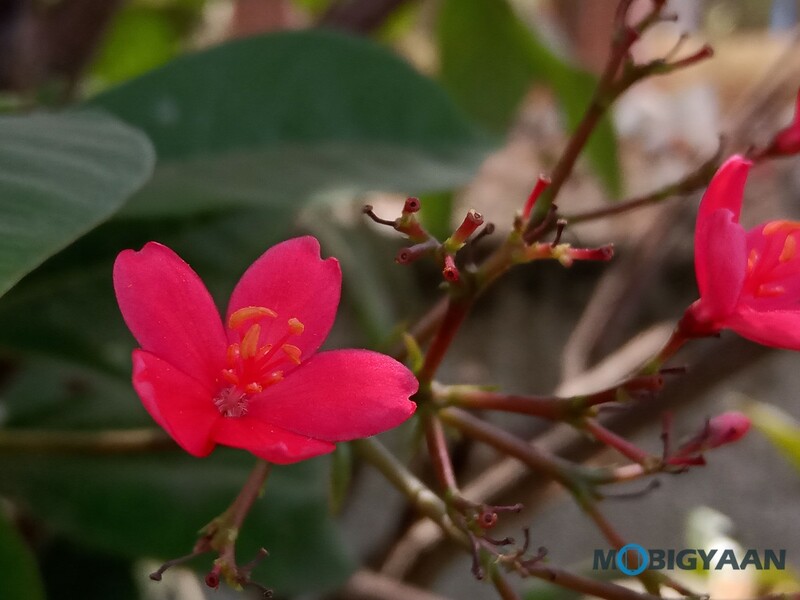 The primary sensor has an f/1.8 aperture while the second sensor is used for depth sensing for Portrait mode. 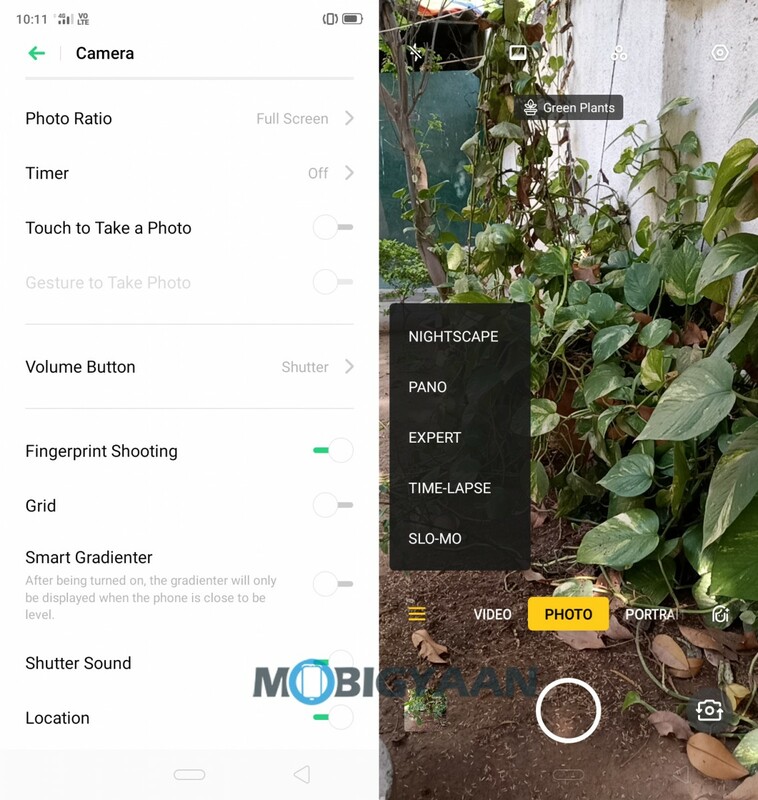 The company has also overhauled the camera app. It now comes with two new features for photography — Nightscape and Chroma Boost. The AI camera comes with scene recognition feature that recognizes 16 independent scenes and 100 scene combinations. 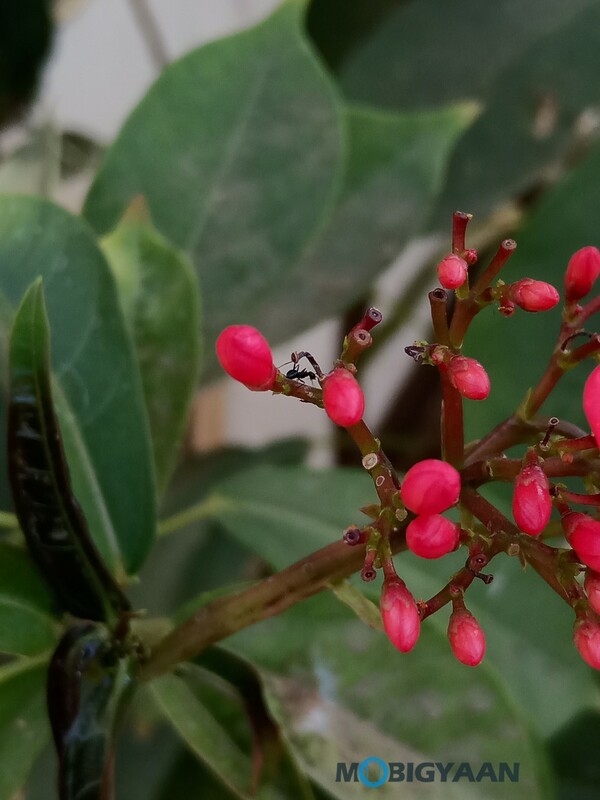 The camera performance of the smartphone is pretty average. It isn’t bad but isn’t great either. It captures good images during the day, giving bright and clear images with minimal grain in the objects close to the camera. In low-light photography, sharpness and natural color saturation is missing and the shots are grainy. In the Nightscape mode, while it does improve the image captured, it also changes its natural colors. The Chroma Boost feature basically increases the color saturation for the images. 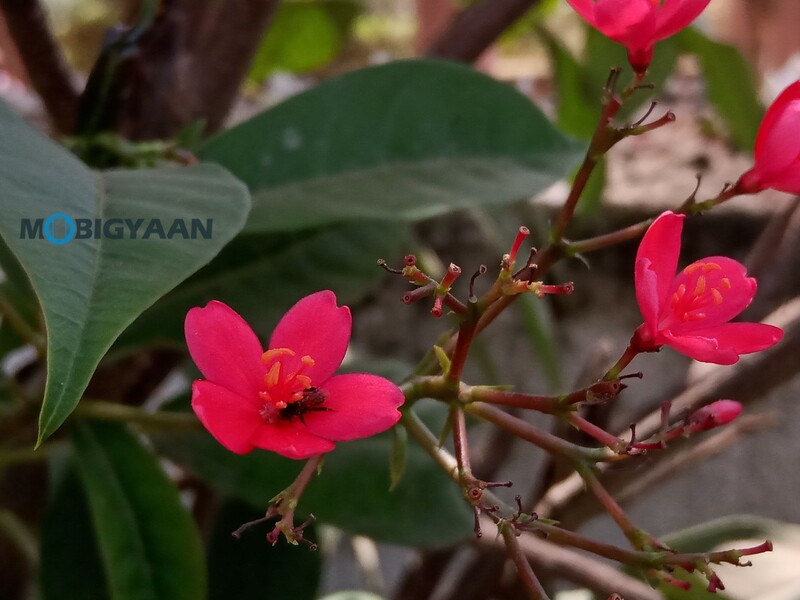 Bottom line is that the images captured using Realme 3 during the daylight are good but fails when it comes to low-light photography. On the front side, it comes with a 13 MP AI camera which performs well in detecting and taking selfies and group selfies. The images captured using the front-facing camera are a bit brighter. 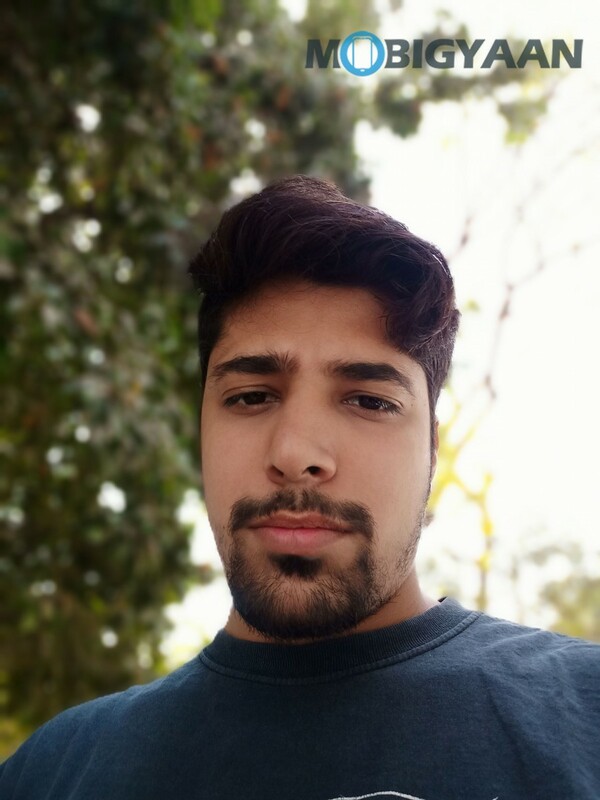 Using the Portrait mode for selfies smoothens the skin-tone a bit. The edge detection works well for the most times and occasionally misses. It blurs the background quite aggressively, making your face stand out in the image. 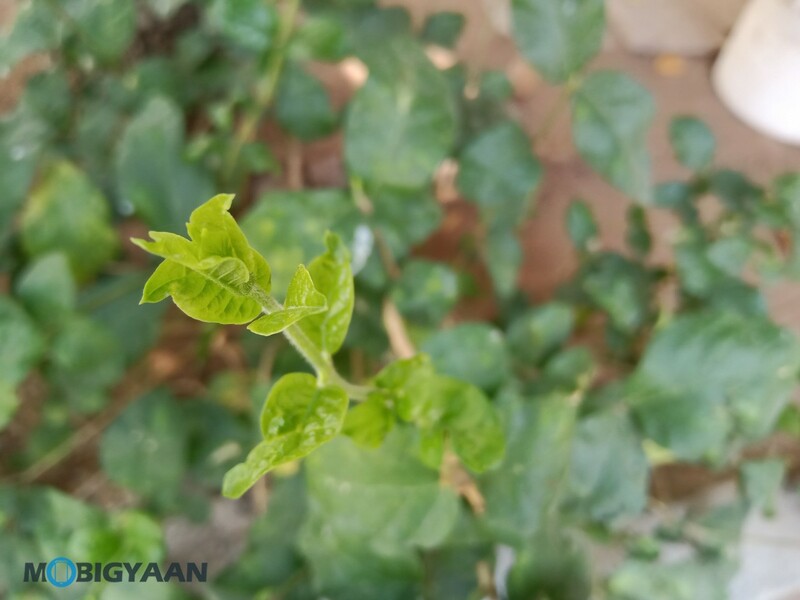 Here are the camera samples of the Realme 3. The phone is powered by a huge 4230 mAh battery, which is pretty good. It easily lasts through the entire day on medium usage, which includes a few phone calls, using social media apps like Instagram, WhatsApp, and Twitter and watching videos of YouTube. With moderate usage, the battery life can last for a day and a half. While the battery is impressive, the same is not the case when it comes to charging it. As said, instead of the new USB Type-C port, the company is offering the older micro USB port. It also doesn’t support fast charging but the company claims that the device can be charged up to 49 percent in just one hour. Both SIM slots support 4G VoLTE, so your Jio SIM will work along with any other telecom operator’s 4G data connection. The call quality was good and the audio was also clear on both the sides. The phone is quite good for its price tag. It has a good design and feel to it and offers smooth performance, but fails when it comes to the camera. It handles multitasking and comes with the new Android 9 Pie OS out-of-the-box. But the camera performance is something that could be a deal-breaker if you are into photography. I would recommend this phone only If you are on a tight budget and looking for a phone with decent performance and impressive battery life.